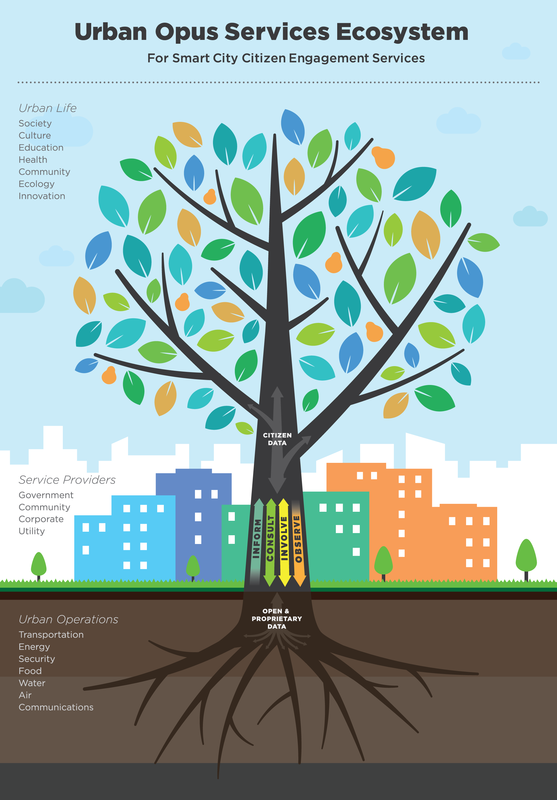 In preparation for some workshops Urban Opus has created a poster (below) to illustrate the how open, proprietary and citizen data co-exist in smart cities intent on effective public engagement. The key insight is that most cities currently have completely unbalanced priorities related to the Inform, Consult, Involve and Observe interaction channels with their citizens through data. Healthy, smart cities will seek to cultivate an evolving, transparent balance. ESRI has separately classified citizen engagement into seven categories as follows: Public Information, Public Reporting, Solicited Comments, Unsolicited Comments, Citizen as Sensor, Volunteerism, and Citizen as Scientist. These categories reflect the top-down imbalance discussed above. None of the ESRI examples exhibit any forms of immediate data-driven feedback or gratification for citizen participants, meaning that they rely entirely on good will rather than self-interest. A healthy society can always depend on significant levels of good will, but such health is founded first on the general fulfillment of self-interest. The fundamental design of citizen engagement apps dependent on consultation and involvement must deliver immediate and regenerative gratification if they are to be sustainable. The poster also appears in a recent Urban Opus article in Curb Magazine. Please email david dot vogt at urbanopus dot net for a copy of the poster or the Curb Article.